Potato salad is a summer staple, but since potatoes don’t mesh with a low-carb diet, what is a picnicker to do? Never fear, because you don’t have to give up on picnic salads. Making the salad with cauliflower instead of potatoes is just as good, and in some ways, superior. Potato salad can get heavy, but this version is really light and refreshing. 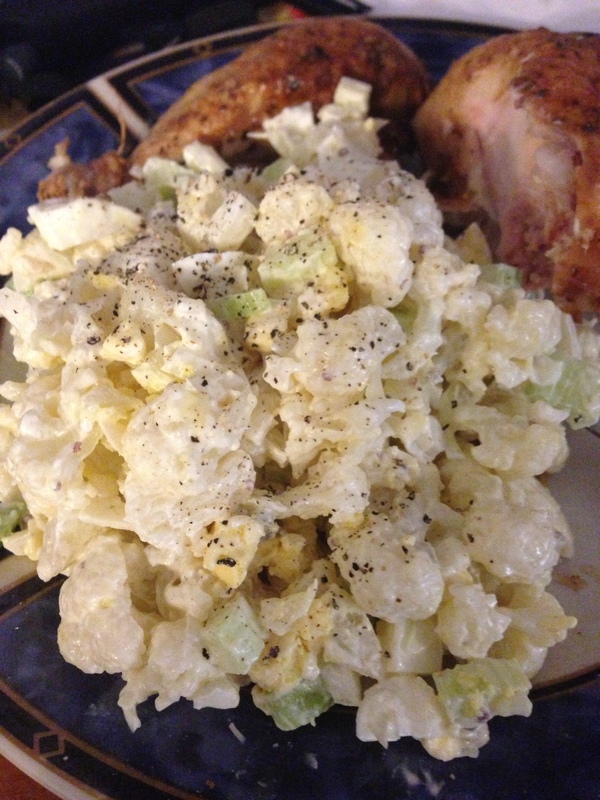 Just like potato salad, there are many versions and variations on the theme of cauliflower salad. I put together elements from several recipes, and I think this version is really flavorful and not over-mayonnaised. Break the cauliflower up into florets, and steam in the microwave until it is softened. Don’t overcook it until it’s really soft; it’s ok if parts are still a bit firm. Let it cool, and then break up the florets into smaller pieces. This can just be done with your fingers. Set the cauliflower aside in the fridge while you get the rest of the ingredients together. 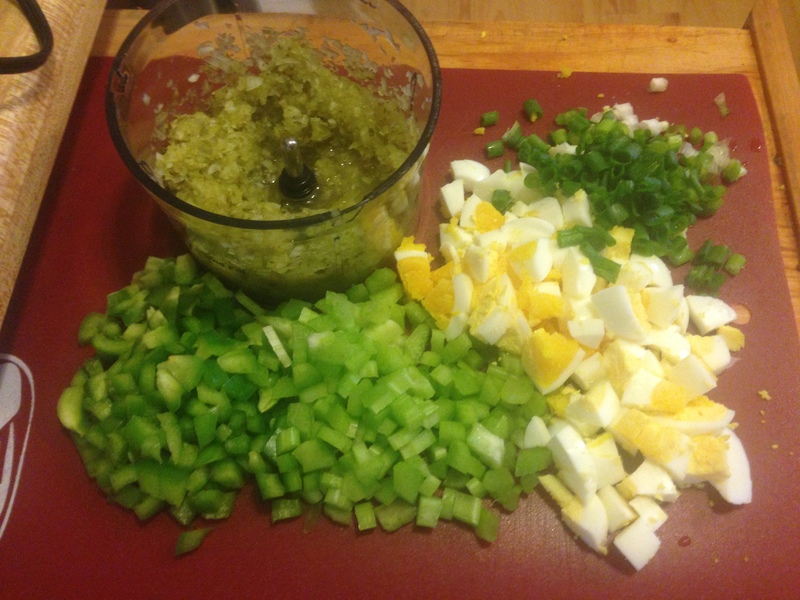 Cut the pickle and onion into large pieces, and put them in a food processor. Blend the pickle and onion until it’s the consistency of relish, going in pulses and scraping the sides if needed. Put the processed pickle and onion into a large bowl, and add the rest of the ingredients, except the cauliflower. Stir everything until it’s well combined, and then add the cauliflower and gently stir to mix everything evenly. Chill and serve with something tasty. The fresh chives are completely optional. If you happen to have them on hand, they look really fancy and add a nice flavor. Dried could work, as well, but either way, I wouldn’t go out and buy any just for this salad. I tasted this and it is wonderful. Thanks for sharing Suzanne! Thank you for this recipe going to try this weekend! So trying this!!! Very excited! Oh this will definitely be on my menu!